You wedding is one of the biggest days of your entire life. A moment that you will look back on fondly forever. This means it is important that everything is exactly how you always envisioned it, especially considering every moment of your wedding is likely to be photographed. A lot of thought goes into the decorations, the food, the band, and even what everyone is going to be wearing when it comes to planning a wedding. But the one thing that many brides overlook is their smile. Your smile is on display the entirety of your wedding, and will be featured in every picture taken. Fortunately, there are a variety of ways we can work to ensure you are sporting your best smile on your wedding day. Taking only about an hour to complete, Zoom! Teeth Whitening can make your smile up to ten shades whiter in just one office visit. Zoom! uses a special hydrogen peroxide formula that is light activated. A gel is applied to your teeth, and then the solution is activated by a special light. This process usually takes place over three twenty minute periods (in one office visit), and you will leave sporting a beautiful, improved smile. If you have a bit of time between now and your wedding, and you have teeth that are a bit crooked or misaligned, consider treatment with Invisalign. What is exceptional about this orthodontic treatment is the fact that the aligners are made from a clear plastic. This change in material comes with many benefits that we are sure you will enjoy. For instance, we are able to custom mold this treatment to perfectly fit your mouth, meaning at no point of your treatment should your aligners harm or damage your mouth (both of which are common complaints with metal braces). You already have enough on your plate, why add to it with the discomfort of metal braces? Because this plastic is also clear, your aligners will be virtually invisible once in place against your teeth, and you will be able to smile just like you always could without anyone even noticing the treatment in place. Unlike other orthodontic treatments, Invisalign is completely removable. This means that even if your full treatment isn’t complete by the time of your wedding, you’ll still be able to remove your aligners for your ceremony and photos. Best of all, the time you have already spent with the treatment will ensure that you have a straighter smile at the time of your wedding. Dental Bonding: This non-invasive treatment uses tooth-colored resin. The material is bonded to the damaged areas of the tooth, filling them in and restoring a natural look to your smile. Veneers: Similar in function to dental bonding, this treatment utilizes thin shells made from porcelain to cover up cosmetic flaws. These shells are bonded to your teeth using dental cement, and they can restore beauty and function to your smile. Dental Crowns: For teeth with more serious flaws, we can use dental crowns. These shells made from porcelain are the next level up from veneers, and are used to cover the entirety of the tooth. Dental Implants: Finally, if you are being kept from the smile of your dreams due to missing teeth, then dental implants can help. This treatment uses dental crowns combined with titanium tooth roots to perfectly replicate the look, feel, and function of your natural teeth. If you are unsatisfied with your smile now, then that is unlikely to change before your wedding day if you don’t seek the care you need. 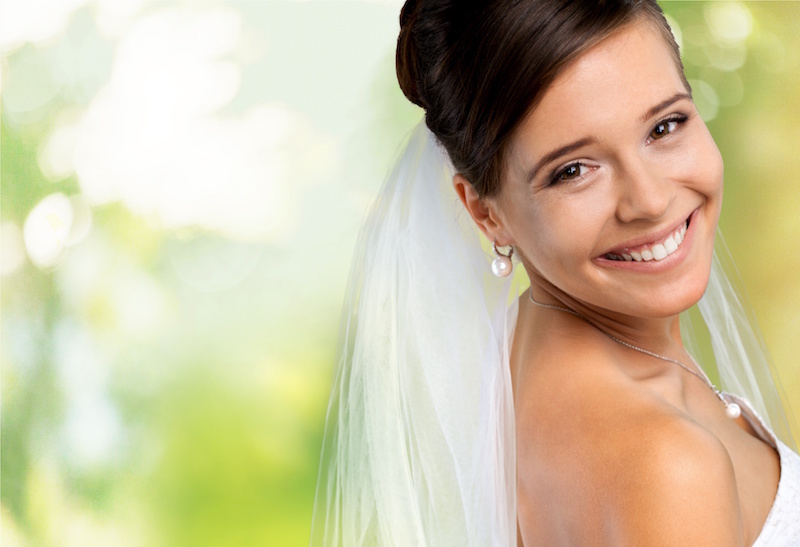 With the treatments above, you can rest assured that your big day won’t be marred by a smile you aren’t 100% proud of. To conclude, we congratulate you on your upcoming wedding, and wish you the best!